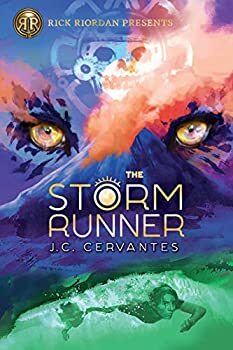 The Storm Runner (2018) by J.C. Cervantes is the second book put out by Disney-Hyperion as part of their Rick Riordan Presents imprint. Aimed at Middle-Grade readers, the imprint’s goal is to “elevate the diversity of mythologies around the world” and publish “entertaining, mythology-based diverse fiction by debut, emerging, and under-represented authors.” The first, which focused on Indian mythology, was Aru Shah and the End of Time by Roshani Chokshi. Here the underlying mythos is Mayan, and while I love that readers will be introduced to a new culture’s stories, which are absolutely fascinating, The Storm Runner is unfortunately a weaker entry for the imprint’s second go-around. Zane Obispo is a young boy who lives with his mom and his uncle Hondo in New Mexico. He thinks his life so far hasn’t been all that great, with a mystery dad he’s never seen, one leg shorter than the other that forces him to use a cane, and so much bullying at his prior school that his mother homeschooled him for a year before getting him into a new private school. The two joyful aspects of his life are his dog Rosie and the fact that he has an old volcano in his back yard. While he doesn’t think things can get any worse, he’s about to find out that’s not quite true. Turns out his mystery dad is a Mayan “supernatural,” and Zane is part of a prophecy foreseeing the freeing of the currently-imprisoned Mayan god of death. Soon he’s on the run with a shapeshifter girl named Brooks whom he’s not sure he can trust and his uncle Hondo, chased by demons and gods. If you know Rick Riordan’s PERCY JACKSON books, a lot of that will sound familiar. I had the same issue with Aru Shah and the End of Time; both that one and The Storm Runner don’t feel so much like they are inspired by Riordan’s series but are following a very strict formula or template, almost along the lines of the old syndicate days of Nancy Drew or The Hardy Boys. There’s the episodic structure, the unknown parentage, Zane’s disability akin to Percy’s dyslexia, the same pop references and jokey tone/style that can jar at times, the almost-frenetic pacing, etc. Chokshi was able to distance herself a bit more as Aru Shah and the End of Time went on, and also presented, I’d say, a deeper, richer characterization and mythology, as well as some strong emotional punches. The Storm Runner, though, feels too by-the-Riordan-book, skates too much along the surface of character, and never really delivers any sense of meaningful emotion, though it tries. The book also has other issues: the pacing is uneven, several scenes feel wholly contrived as an attempt to create tension or drama, and more than once I marked scenes that didn’t seem to make much sense to me or that seemed to contradict things that had just been said or just happened. Stakes, while ostensibly high, never felt that way, and the book felt way too long, bogging down in several places and feeling all or more of its 400+ pages. Honestly, I would not have finished it were it not a review copy. All that said, I’m more than willing to admit that the intended audience will most likely find all those problems less of a concern. And we all know kids are more than happy to keep reading the same story again and again and again (thus the success of those earlier syndicate books and all the more recent series such as MAGIC TREEHOUSE, WARRIORS, and the like). And the goal here, of introducing young readers to other mythologies, other cultures (The Storm Runner succeeds much more with the former than the latter), is certainly laudable and to be encouraged. Given all that, I still can’t recommend this attempt simply because, to my mind, there’s so much out there that is better (even within this new imprint). But if you (or your kid, if you’re a parent) ate up Riordan’s books, then you may as well give this one a shot, too. If you enjoyed it, stop into the comments and tell me I was wrong. Publication date: September 18, 2018. A contemporary adventure based on Maya mythology from Rick Riordan Presents! Zane has always enjoyed exploring the dormant volcano near his home in New Mexico, even though hiking it is challenging. He’d much rather hang out there with his dog, Rosie, than go to middle school, where kids call him Sir Limps a Lot, McGimpster, or Uno — for his one good leg. What Zane doesn’t know is that the volcano is a gateway to another world and he is at the center of a powerful prophecy. A new girl at school, Brooks, informs him that he’s destined to release an evil god from the ancient Maya relic he is imprisoned in — unless she can find and remove it first. Together they return to the volcano, where all kinds of crazy happens. Brooks turns into a hawk, a demon attacks them in a cave, and Rosie gives her all while trying to protect Zane. When Zane decides to save his dog no matter the cost, he is thrust into an adventure full of surprising discoveries, dangerous secrets, and an all-out war between the gods, one of whom happens to be his father. To survive, Zane will have to become the Storm Runner. But how can he run when he can’t even walk well without a cane? This made me think that I should go look around for nonfiction about the Maya for this age group. That could be interesting.